A quality built retaining wall can provide many benefits to your home and yard, do you need to tame a slope, address the problems of erosion and collapse, create levels in your landscape to give a decorative look, or looking to create a large level area which can then be used for more practical entertainment, outdoor living or garden designs? You must consider the type of construction, size, drainage, style, material strength and colour, when constructing a retaining wall so that all the elements of your landscape design and home complement one another. Retaining or freestanding walls can also be used for beautification, privacy and security purposes, perhaps around one end or side of a pool area or garden. When it comes to walls there is no room for compromise. Walls that have fallen or are falling down are very difficult to repair, and can pose a danger to you, your property and passers by. 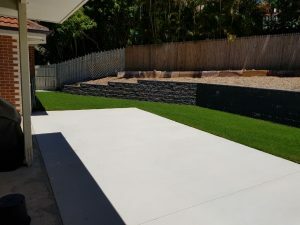 Brisbane Home Landscaping specialize in landscape construction and are highly experienced in retaining wall construction for many types of walls and for all kinds of purposes to suit all types of landscapes in Brisbane Northern Suburbs area. Brisbane Home Landscaping will look at what space is available for your project, the property boundary conditions, wall height, soil parameters, loading conditions, foundation conditions, flood level conditions, ground slope conditions above and below the proposed structure, durability, aesthetics and overall budget constraints when discussing the type of block wall to best suit your project. Terry from Brisbane Home Landscaping can guide you to making the right choices for your landscape construction, garden design and home aesthetics. Herron retaining blocks are a popular choice both structurally and visually to build your landscape projects due to their rich natural colours and design flexibility. Choosing this block means virtually no maintenance with a quality product and Brisbane Home Landscapers knows how to build it to last. Natural stone can add charm to any landscape and is suitable for decorative or structural walls as well as being very durable, lasting as long as the home itself. A combination of stone and concrete make for an attractive strong and long lasting retaining wall. 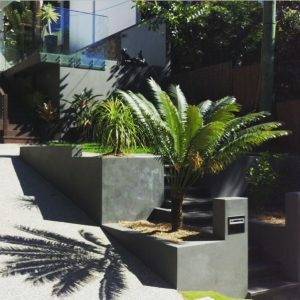 Natural stone retaining walls from large rock to smaller cut rock, are very effective for enhancing native trees and shrubs to achieve a style of garden unique to Brisbane and our Queensland climate. Trendstone blocks are the perfect choice when you want to create a contemporary and classic atmosphere. This distinctive retaining wall system is suitable for all outdoor retaining wall construction applications. Timber is an alternative material for landscaping projects on a structural or decorative retaining wall. The natural appeal, strength and versatility of timber is ideal for a cost effective retaining wall application. 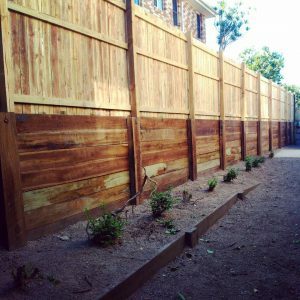 When constructing a timber retaining wall in your home, it is essential that these retaining walls have the correct drainage systems to prevent erosion or collapse in our Queensland climate and Brisbane Home Landscaping have the solution for your project. Also known as Block wall or Interlock wall; Besser Block Retaining Walls are a long lasting, solid retaining wall system and are a popular choice as an external feature, incorporating rock face cladding to your home can be a great look. 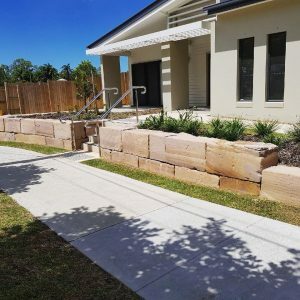 With over 30 years in the landscaping construction industry you can trust the knowledge and expertise of Brisbane Home Landscaping to help you choose the right retaining wall for you and your property ensure it’s resilience for years to come.